Three people have been accused of conducting a slot scam, where they managed to steal $420,000 from the Mohegan Sun Casino in Pennsylvania. It appears to have been an inside job, as the one of the most recent arrests was of Robert Joseph Pellegrini, the casino’s vice president of player development. The other two that have been arrested was beverage server Rochelle Poszeluznyj and a regular player at the casino, Mark Joseph Heltzel. They have been charged with theft, identity theft, fraud, conspiracy, computer trespassing, among other transgressions. The scam could be made into a movie with how it was planned and executed. Poszeluznyj would go around collecting player reward ID and PIN numbers from the customers she was taking orders from. She would then pass these numbers off to Pellegrini, who would use the numbers to create reward cards. On each of the reward cards would be free slot play credits. The final step in the scam would be to give Heltzel the cards, who would then gamble at the machines with them. The winnings would be split between the three, but police claim that they were able to make $418,793 in winnings from $478,000 in unauthorized free slot play. This started in May 2014 and went on until April of 2015. The scam was brought to light when a casino dealer, Matthew Crane, notified the police in April. It appears that Crane was romantically involved with Poszeluznyj, who also seemed to have something with Heltzel. You could say the love triangle and jealousy is what really brought the scammers down. Mohegan Sun confirmed that Poszeluznyj nor Pellegrini work there, which is a big relief for the regulars! Pellegrini was released on a $500,000 bail, while Poszeluznyj was held without bail for the time being. 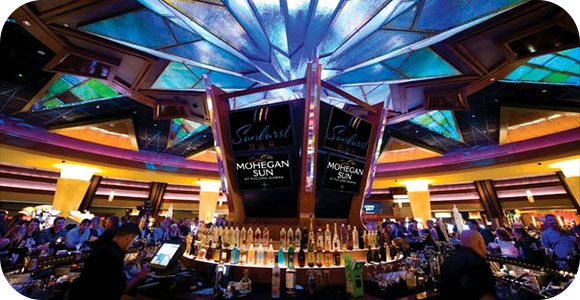 It isn’t the first time the Mohegan Sun has been hit by insider theft, as their original casino in Connecticut lost $79,000 due to a blackjack dealer overpaying his accomplice. This is one reason that all casino games, including the slots, should have careful eyes watching, as the thieves come up with interesting ways to steal.